Bloggo: Now this is more my scene - shooting people. Why, I haven't had so much fun since 'Pug Face' Mahoy and me were holed up dahn the Old Kent Road with only a shotgun, two revolvers and a pea-shooter between us and a long stay in Dartmoor. Sharkey's Moll is simple straightforward shoot 'em up action in the tradition of Operation Wolf and a thousand others. The difference is that this game is about a third of the price of all the others without being a third of the fun. Plenty of baddies, five different locations and lots and lots of shooting. Not a lot of scenario - shooting gangsters and rescuing your girl - but who needs it? All you need to know is that you've got bullets and molotovs and you've got to wipe out everyone onscreen - except the vital end of level stool pigeon. 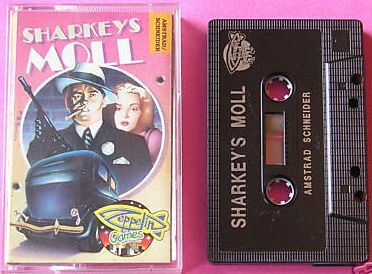 If you like this style of shoot 'em up, you could save some shekles by buying Sharkey's Moll rather than the pretty similar full price games.